On December 20, 2011, Patricia Lidia in Romania, kindly presented a haiku calendar to us. The haiku calendar was made by Ioana Dinescu and Constanta Erca in Romania. Here is a photo of the month June. Today is June 2. Five months have passed after we welcomed the new year 2012. Haiku friends of mine have enjoyed their haiku life in their own ways. On May 10, Ms. Roberta Beary in USA sent me an e-mail as follows. I wanted to share my honorable mention haibun with you for this year’s Genjuan International Haibun Contest. When my husband and I arrive in Japan we promise each other it will be for three years. Three years turn into five. And for one of us, five years turn into forever. Back in the United States, I cannot forget Japan and what I left behind. Now I am a single mother with two small children. How will I raise them on my own? In my struggle I recall a word I often heard in Japan. Gambatte. A word that is hard to translate. Some explain it as ‘be strong’. Others as ‘do your best’. To me Gambatte means ‘keep going’. Over and over I say it. Gambatte becomes my mantra. I keep going. Little by little pieces of my old life mingle with the new. My children’s names in katakana on a scroll above their beds. I eavesdrop as they read side-by-side in tiny rocking chairs. First one story Momotaro the Peach Boy, then the other Kaguya-Hime the Moon Princess. Time keeps its own counsel. Children grow up and move away. But always, with a sweet nostalgia, I remember Japan. 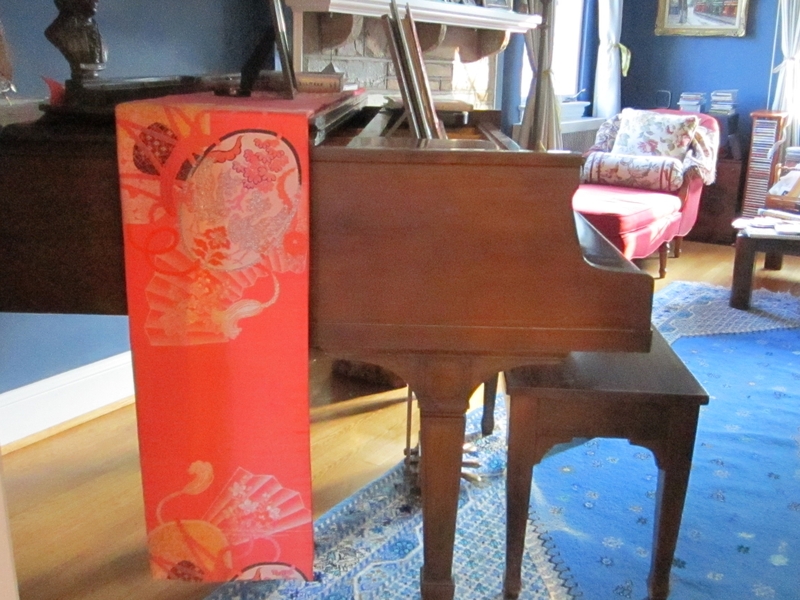 Here is another picture of the red silk obi. Last of all, I would like to introduce Roberta Beary to you. Roberta is a haiku friend of Alan Summers’ and mine. She says in her e-mail as follows. Thank you for including haiku from my book, ‘nothing left to say’ at the Int’l Haiku Spring Festival in partnership with the 2010 Bath Japanese Festival. I got to meet Alan Summers last September when I traveled to London. He is an amazing person!! Here is the short introduction: Roberta Beary was born and raised in New York City. 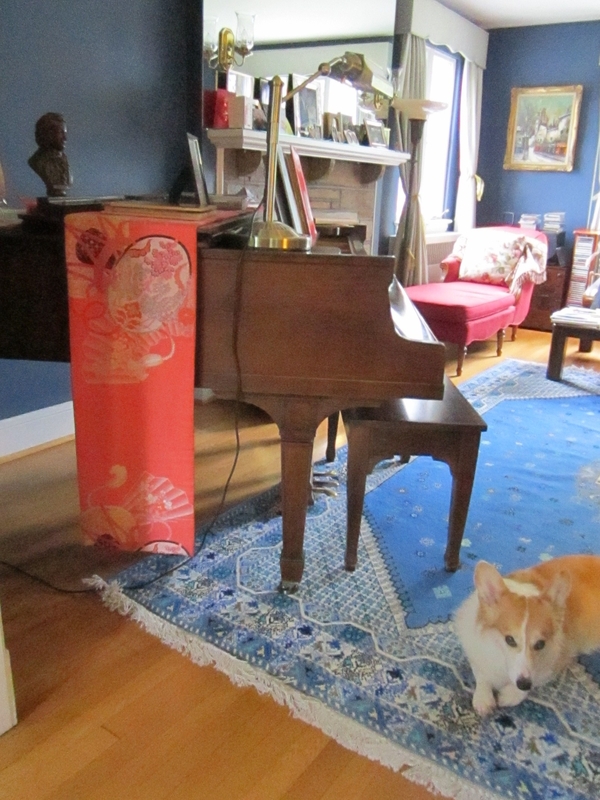 In 1990 she moved to Japan for five years of haiku study. Her individual poems, an unconventional hybrid of haiku and senryu, have been honored throughout North America, Europe and Asia for their innovative style. Her book of haiku and senryu, The Unworn Necklace (Snapshot Press, 2007), selected as a William Carlos Williams Book Award finalist (Poetry Society of America), was named a Haiku Society of America Merit Book Award prize winner. 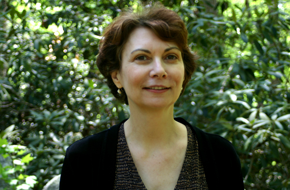 She also co-edited two Haiku Society of America anthologies both of which were named Merit Book Award winners. Her most recent work, a chapbook titled ‘nothing left to say’(edited by Michael Dylan Welch) is the 20th title in the Hexagram Series of master haiku poets. Here is the photo of me which appears on my book of haiku, The Unworn Necklace, winner of the Poetry Society of America Finalist Award. A hardcover edition will be published this year by Snapshot Press, UK. Now I present the first haiku from her book ‘nothing left to say’. The next posting ‘「草枕」国際俳句大会 （１）’ appears on June 9. I have many favorite posts here, but this one seems very special indeed. That haibun is beautiful for all the depth of love, courage and grief present in it. I continue to enjoy my visits here and hope to send you something in the future. Be well and enjoy your summer.